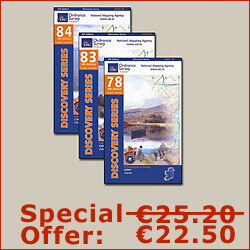 At 1,039m, Carrauntoohil is the highest mountain in Ireland. Along with the outlying MacGillycuddy's Reeks, the region provides some of the most rewarding walks in the country. These mountains are not to be treated lightly and anyone following the routes in this book, need to be accomplished in their navigational skills as the walks do not follow signposted trails. The 20 walks in the book are graded on a difficulty level from 1 to 5. The majority of these are a grade 3 and above, so in addition to being a good map-reader, a decent level of fitness is required. 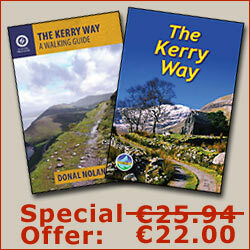 Over half of the walks in the book are complimentary to the Kerry Way. 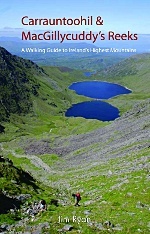 Whereas the Kerry Way skirts around the edges of the Reeks, most of the walks in this book explore the higher reaches of the mountain range. Connecting points between the Kerry Way and some of the walks in the book include Lough Acoose near Glencar, the Bridia Valley and the Gap of Dunloe above the Black Valley. The starting point of Kate Kearney's Cottage can be linked to the Kerry Way at the Black Valley by following the road through the famous Gap of Dunloe. This would provide an alternative start to the Kerry Way. There are full-colour photographs throughout the publication and 14 maps based on the OSI Discovery Map 78. In addition to the described walks, a large section of the book develops an overall appreciation for the region through geology, history, placenames, farming, flora and fauna as well as an introduction to some of the personalities and landowners from the area. The sections on climate and Mountain Rescue are important reading before setting out on any of the walks.